I wonder how many bike related companies can boast of 50 years in the production of one product? But SKS announced just that with the anniversary of the Rennkompressor, which Google Translate tells me is Racing Compressor. Cool. They even have a website where Rennkompressor owners can tell about their experiences with the product over the years. Scrolling down the website, it’s like love letters and life testimonies to a floor pump. How odd, but how cool all at the same time. In a world of disposable, maybe get a season out of it products, this is nice to read. Go here to read up about it or add your own testimony. But I was not interested in the special color, limited edition version of the Rennkompressor. I wanted a pump I could keep in my car that would be decently compact and rugged enough to stand the tossing around it would get. Lots of plastic would not get the job done. 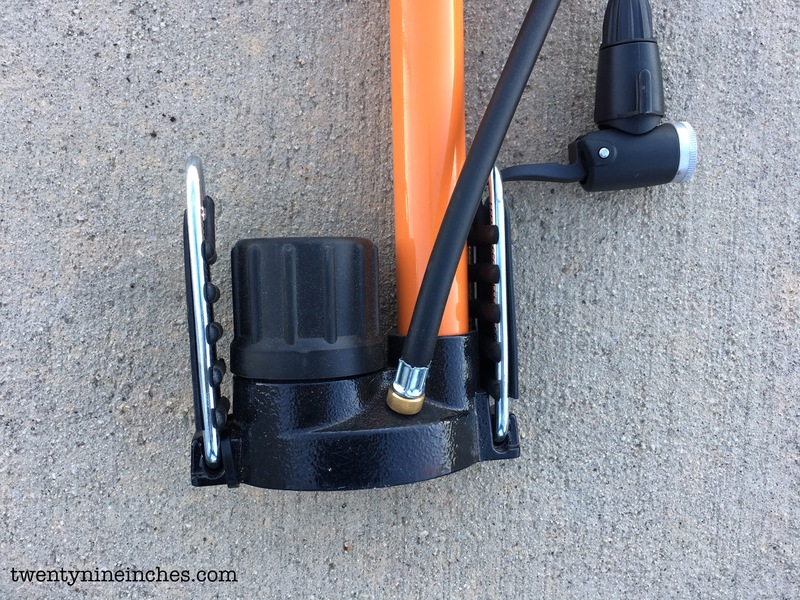 It also needed to work across multiple cycling disciplines…MTB to road, so it could not be too high volume a pump or it would be hard to get to 80-100psi. With my wife claiming the SKS Airmenius for her own car, I was in need. 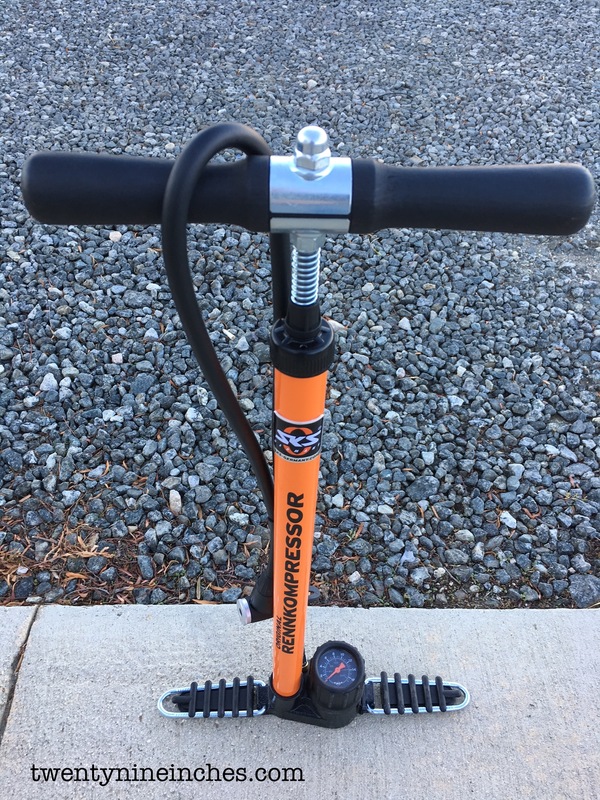 So when I saw the bright orange standard Rennkompressor at a Magura Press Camp, where SKS is an attending vendor, I was pretty sure I had found what I was looking for. A bit of history standing right there. Hefting the Rennkompressor is a task. It’s a solid beast and the base is a chunk of metal. The skinny barrel is metal too. 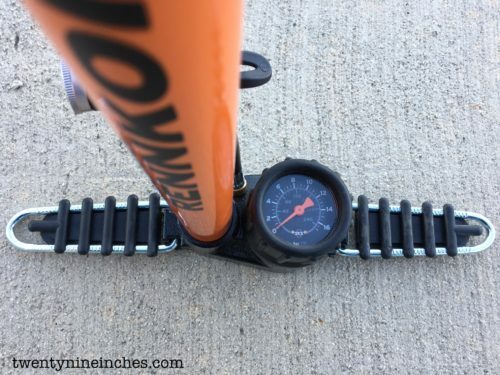 The smallish gauge is rubber covered and the support feet fold up/down for storage or use. Metal too, of course. The hose is long and you can get different chucks with it. The handle is solid wood. It looks like something out of the past, which, I guess, it is. The large acorn nut on the top of the handle…the external spring on the pump shaft. Funky. Using the Rennkompressor is almost an experience of its own. 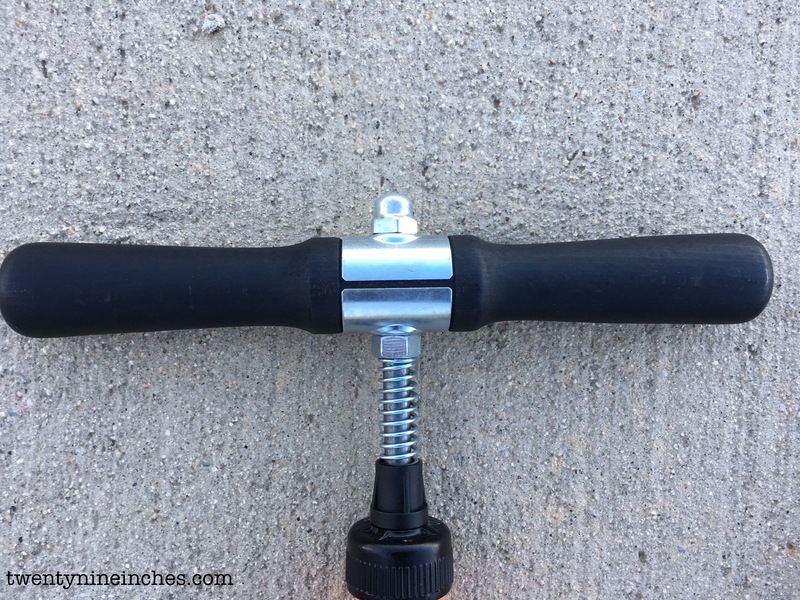 It has this zingy-springy-boingy noise going on as you work it and the stroke effort is very low, making one handed use pretty easy to do, although the acorn nut sits right where I want to put my hand when doing so. Its definitely a high pressure/low volume pump, but it will get you there eventually with a fatter MTB tire. For gravel or road, it is da’ bomb. The gauge is in 10psi increments up to 240psi. Track guys maybe? And of course the bigger numbers to read on the dual marked gauge are in Bar….silly Europeans. Still, I can get to 80psi and 40psi easily and clearly, both numbers I use for road and gravel bikes. 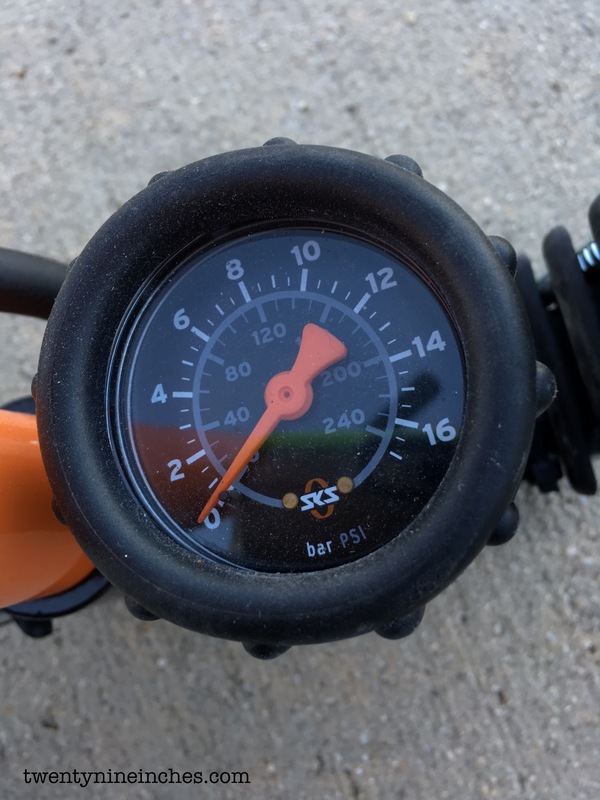 If I wanted to get to 75psi…that would be guesswork and an Airchecker (LOVE that little guy). The stability is pretty awful, so it does not stand up on its own two…well, feet…very well when unattended. But that slim profile allows it to store better without a big triangle section for a base like most pumps have. Every darn small part on the thing is replaceable, or so it looks from this catalog shot. Try that with most air pumps from China-to-you factories. It’s German. It’s orange. It’s tough as hell. It makes funny slidey-springy noises when I use it and when I make turns in the car with it in the back of the Subaru. It’s rebuildable. 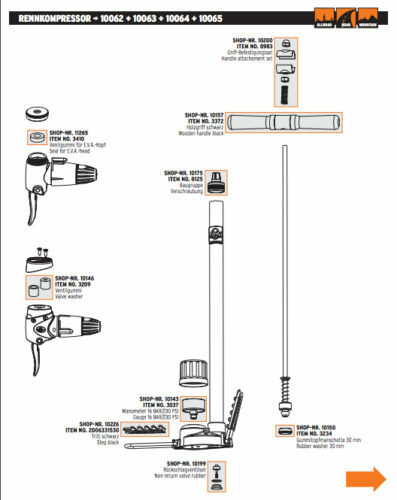 Its accurate and easy to use. And it’s a legacy item, damn near historical. How cool is that?